Each new development in the field of technology provides a major boost to the e-commerce sector. These days, most people prefer to purchase a product online from an ecommerce store instead of going to a local store. With digital marketing techniques improving and progressing in every aspect, ecommerce owners are figuring out new strategies to market their products and attract more consumers. Launching an online store is only one integral part of the journey. A trusted ecommerce development company will always develop sites on a secure platform like Magento. If you already have one, consider making it more flexible. The overall product navigation on the site must be flexible and user-friendly, so that visitors can find the right product that they are looking for, easily. Amore over, ecommerce sites must be secure enough in terms of payment getaway so that consumers can purchase products seamlessly without any hassle. It is very important for an ecommerce owner to focus on the landing page of their website. This is the first page that consumers see when they visit your site. You need to make your consumers aware of the USP of the products you sell. Displaying a “Top selling products” or “latest products” section on the landing page can attract more customers who would eventually make a purchase. As a website owner if you are looking for a Magento ecommerce development company, ensure that the company experts stress on improving the landing page of your site on a priority basis. You need to put yourself in the shoes of a customer who urgently needs to buy a product. This would help you understand things from the consumer’s perspective and work on improving the functionality of your site accurately. As a consumer, you would want to search for a product quickly, check the product details from the results page, read reviews, look at the price and then proceed towards making payment. You need to provide your consumers with this seamless user experience. The search results of your website should also be able to come up with the right list of products. As a website owner, you need to keep things in place and ensure that the conversion process is smooth enough for your customers. A responsive ecommerce website is what every consumer looks for these days. With most individuals using mobile phones these days, the mobile version of your store is of utmost importance. Your mobile application can let you connect to more consumers and can enhance the visibility of your ecommerce store. Therefore, for people who wish to stay ahead of their competition and boost sales on their store, it is important to have a mobile version of your store. Product details are an important part of any ecommerce site. Keeping product details updated and maintaining product attributes and features is of great importance these days. Include key features and bullet points to make product details short and clear. Provide the ecommerce development company you hire for your website with high-quality images of the products you sell so that they can add them to your website. The right kind of images and description are a powerful tool that attracts consumers. So, add product description clearly, add more images and videos to make it interesting for your consumers. It is important that ecommerce owners introduce cross-selling and upselling on their website to boost sales revenue online. This can offer consumers a better shopping experience and boost your online sales largely. However, always keep in mind that the products you are selling must be relevant to the main featured product. The extra products that you offer must be relevant to the original product and should add value to it. Looking for product reviews has become an integral part of the buying process. Reviews play a major role in building trust, especially when your ecommerce site is new. As an ecommerce site owner, make it a point to include product reviews on your product detail pages. You can also send customers emails asking them for product reviews. You could provide customers with incentives in the form of discount coupons to encourage them to leave their reviews. One of the main issues with any ecommerce site is that users abandon their shopping cart before they make a purchase. This can frustrate ecommerce owners. Consumers may not be happy with the shipping charges or the delivery method. Also, the shopping process might be very lengthy, and consumers may feel lost midway. Often, consumers are worried about the security of online payment getaways on an ecommerce store. So, if you are looking for a reliable ecommerce development company, ensure that they work on cart abandonment issues to reduce problems at the earliest. 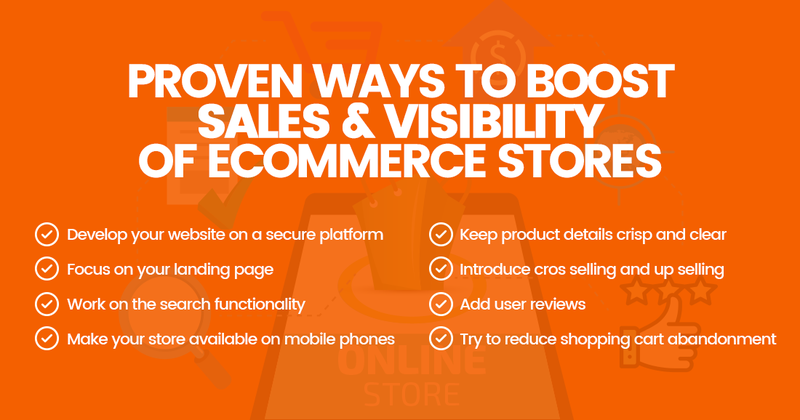 These are some of the most important ways to boost sales and visibility at the same time on your ecommerce store. To sum up, developing website on a secure platform, focusing on the details you provide on product landing pages and improving the search functionality of your website should aid online visibility and ecommerce store sales at the same time. Adding user reviews, clear and short product descriptions, high-quality videos and images of the products you are selling is always a great idea to reach out to more consumers and convince them to purchase products from your store. Do not forget to introduce the concept of cross-selling and upselling along with the original product that you are selling. The ecommerce developers you hire must also try to reduce shopping cart abandonment and develop a mobile version of your ecommerce store for better online visibility.